My Road Trip to Ladakh: Part 2 of a memorable adventure! Still down with a hangover of Ladakh but bound by a promise to come back with Part two of my road trip to Ladakh – here I am! Nope, it is not being melodramatic, but it is true. The Ladakh fever even after a week is just so strong that all I wish to do right now is to head right back there. However, as a humble blogger, my duties to you come first! So here goes, part two of the Road Trip to Ladakh. While you can click through for the first part of this 12-day Ladakh road trip, let me attempt summarizing it into a paragraph. After a good start till Jammu from Delhi, our actual adventures started in the form of one car requiring an emergency service and deserting us while we ran into a landslide up the Ramban- Srinagar road. This resulted in a pleasant surprise of discovering the scenic Ramban town by the gushing River Chenab. Further on, we rushed the next day to cover the distance that we could not and therein, we had a day of joyful reunion with the car that had deserted us but at the same time the crazy adventure of attending to a puncture on the high Zojila Pass. After a peaceful night at Kargil, we enjoyed the sights along the way to Leh, where we rested for a day and then, attempted the record that we all had taken this road trip for. The Highest Bloggers meet it was at Khardungla with the OYO team announcing a unique program for the travelers. 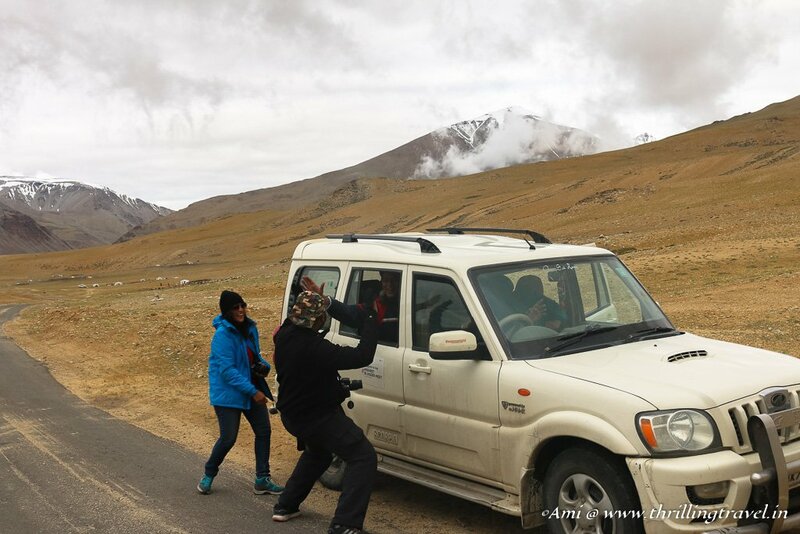 Post the meet, the team split into two – with one set of bloggers returning to Leh to fly back while the rest of us continued to meet and greet the double humped camels at Hunder! Continuing on our high spirits from the previous evening, we set forth for one of our longest stretches to Pangong Tso lake. This time, I shed my inhibitions to become a wild traveler who hung out of her window to capture the passing sights. With Swati as my partner-in-crime, I spelt out a disclaimer to a nervous Samarth that in case he loses me to a valley, my hubby would be more than happy. Crossing over the Khardung La again, we reached the Leh City View point to discover that two cars ahead of us had completely disappeared and the ones behind us were not to be seen! Thankfully the ones ahead of us were all fine but it was a different story for the ones behind us. Seems like Neeraj’s car had given up at Khardung La and need not just a nudge, but a push uphill. However, all was well as we caught them all at Kharoo before we hit the road for 2nd highest motorable pass in the world – Chang La Pass. Of course, not before we took in the sights of the lovely Thiksey Monastery from the outside. As we ascended to this pass. Neeraj’s car completely stopped and a tough call was taken where Vineet and Deepak set back for Leh to get the car working while the rest of us continued to Pangong Lake. I must say that this was the smartest call taken by the ScoutMyTrip team for there was no way one could have crossed the gushing streams, the high plateaus and the gravel pathways in that car. As much as I had the other team on my mind, I could not help enjoy the adventure that we had set upon on this stretch. The early evening gave way to night and all I could see was stars in the sky as Samarth expertly motored his way through those gushing streams to land us at Pangong Tso by 10 in the night. There was no denying the spookiness of this drive but with adrenaline running high, funny songs and a fun bunch of car mates, this little stretch turned out to be one of my liveliest ones on this road trip to Ladakh. Having lost all our bearings in the night, it was a pleasant surprise to see a gorgeous lake staring at us in the morning. The sun kissed lake kept changing colors from an orange-streaked gray to a beautiful bright blue. Enclosed by the mountains that separated us from Tibet, this lake was truly an enchanting sight. After a few photo opportunities, we hit the roads straight to Tso Moriri. The drive on this stretch was just unbelievable – not a person in sight, just flat lands that were bordered by the mountains. The roads were so desolate that I could not help think of what would happen if we had a flat tyre here! Zipping through the landscape, with Indus flowing by our side at some point, we reached Tso Moriri to the lowest ever temperature that I had experienced on this Ladakh Trip. Bundled into layers, we grabbed our dinner and retired to our tent to be woken up rudely and pleasantly by the two lone rangers – Deepak and Vineet. These amazing guys chose to drive through the dark to reunite with the rest of us. It sure was a pleasant and a welcome surprise to be a complete team again. It was a buoyant feeling to wake up as a complete team. In some ways, it was also, bittersweet as we all realized that we were nearing the end of the road trip to Ladakh. The bubbliness in the car was to some extent punctured as we moved ahead to our next destination Keylong. To infuse in some of that missing enthusiasm, we transformed our car to a moving discotheque with Samarth and Abhinav attempting the kinkiest moves while Swati and I attempted to capture it with a camera – just to hold them to ransom someday! 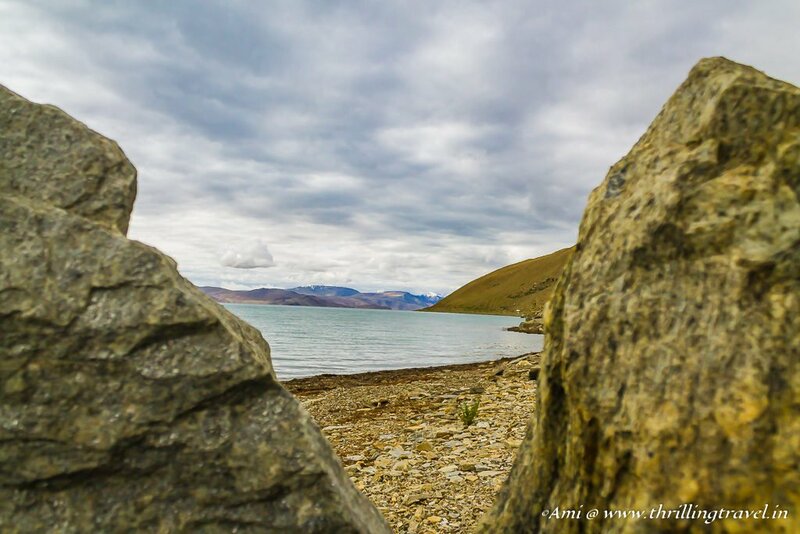 To some extent that did help pick up the mood but what completely had us enthralled was the lovely landscape of Tso Kar Lake and the More Plains. This is where I bull dozed Samarth into handing over the White Scorpio for a short drive down the plains. 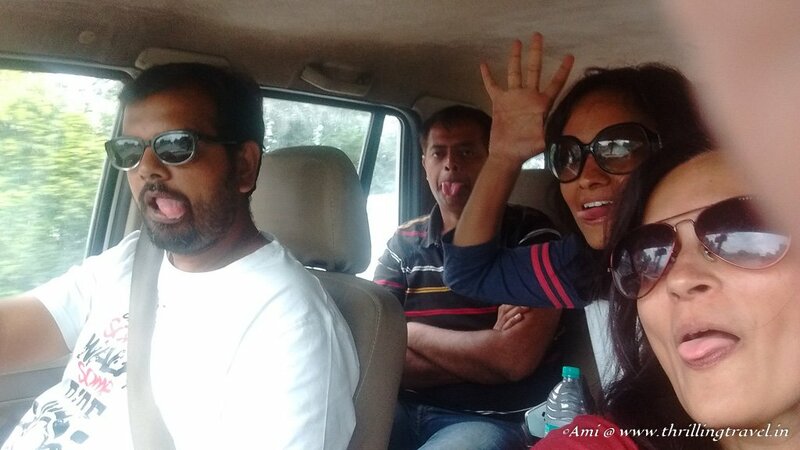 Picture this – Samarth on the Navigators seat holding on to his dear life, while Swati and Abhinav whoop with glee (or fear!) as I fly them down the More Plains. Oh Boy! Even the thought of it gets me on a complete high. Like a good girl, I handed back the car the moment we touched the mountains and went back to my meek, quiet self ( Oh yes, I can see those rolling eyes!) for the rest of the journey – all the way to Keylong. This stretch was particularly melancholic for a lot of reasons – one being our own mood and the other being the lores that I share tell you in my next posts – of the places we saw along the way. The atmosphere in the car was getting dreary by the day and we just needed a jolt to snap us out of it. Luckily for us, we got that in the form of the low fuel situation in one of our cars. The fuel station at Keylong had run out of diesel and in a bid to find some, one car set off to the next town to get a can-full. The rest of us took over a small little shop in Tandi for some card games, snacks and tea. Thankfully, the team was able to tank up at Darcha and we set forth as soon as they returned. Though the landscape was stunning, nothing felt the same given the impending end to our trip. Yes, we attempted capturing it all but definitely, the number of clicks had drastically reduced. 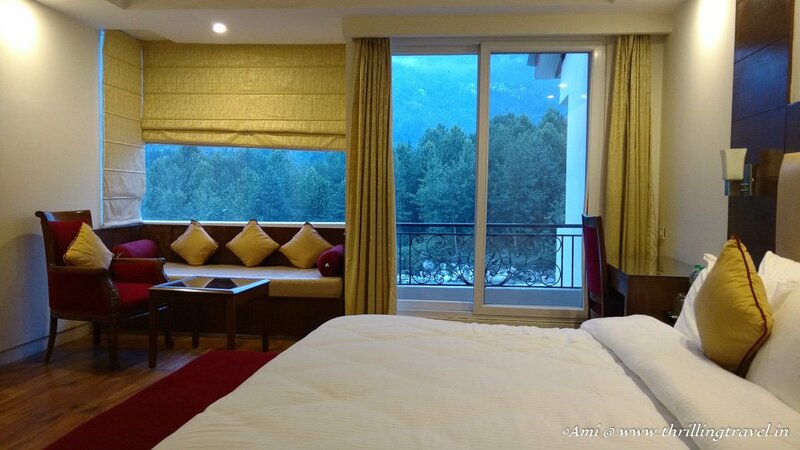 After a brief stop at Rohtang Pass, we reached Manali to one of the most beautiful properties of OYO rooms by the river Beas. That night, all of us drowned our impending end to the Ladakh Road trip. A fun time on the Dance Floor followed by some crazy sessions of laughter and rude jokes, we retired for the night. I would call this day as the darkest, gloomiest and longest day of the entire road trip to Ladakh. Not one of us wanted to sing. Each car was drowning with depression. This was probably the only stretch where I insisted that I be allowed to take a power nap. With minimal stops, we finally landed in Gurgaon in the wee-hours of Day 12. There were a few interesting incidents along the way – like how Nano Seth tried to convert the Bolero into a Knight Bus and how the team was caught with tinted glasses. However, the only point that I will remember fondly in this entire stretch is Samarth and me trying to keep each other awake to safely reach our destination. Dead in the night, with the google maps on, I was literally seeing two roads instead of one on the screen. As for Samarth, he was just on an auto mode that followed by voice directions. With the last crack of jokes at each other, somehow, we reached the OYO Rooms Gurgaon to retire for the night. Sure enough, there were plenty of adventures along the way but the readiness of the team saved the day. Also, what turned out to be a detour from our plan, became our memories for life. This Ladakh Road trip got all of us into the India book of records for having done the Highest Blogger Meet in Khardungla. It, in fact, gave us one more record of being the first to do so too. No doubt that this accolade will remain precious to each one us but for me, the ultimate high of this road trip to Ladakh would be the memories of laughter, the strange adrenaline rush, the stunning landscapes that we traversed and more importantly, the bonds that we formed with each other. For sure, this road trip to Ladakh is going to be on my mind and in my heart for a long, long time! Ah Well! That is enough of me being emotional. 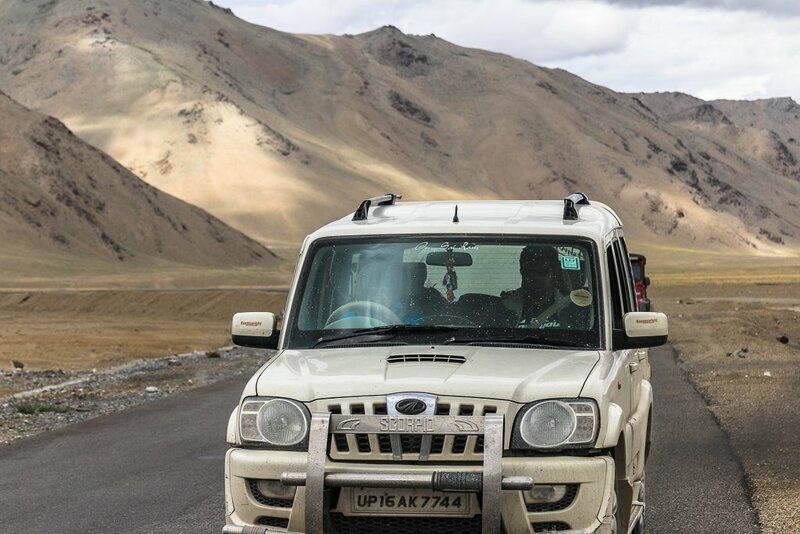 Let’s hear from you guys on what you thought of this entire road trip to Ladakh! Pin this if you plan one for yourself or if you have already been – as a memory for yourself! As warned in my India book of records, please gear up to avoid AMS (acute mountain sickness) by drinking lots of water and taking precautions as mentioned in the hyperlinked article. The roads in this section, especially towards Pangong Tso and Tso Moriri are extremely desolate. There are almost no rest rooms or restaurants available on this route. 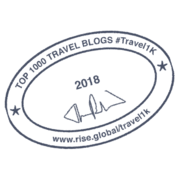 For all the Ladakh destinations except for Leh City, you will need to take Inner Line Permits from Leh. The road conditions on this route range from bad (no roads) to extremely good roads. Note that in the Ladakh region, the roads or paths will lead you through gravel and gushing streams. Hence, ensure that your choice of vehicle has a four-wheel drive like the Tata Hexa or a Scorpio or even a Thar. Avoid night time drives for the same reasons as above. Here and there, you will find small tents advertising Maggi or Hot Tea. Those are your small road side cafes for a quick bite. Please pre-book your accommodations before heading to these destinations as they have limited capacity and there are not too, many options available. While these are the major stops, I have given the actual road routes in part one and this part of the Road Trip to Ladakh. This should help plan your own. This is probably the only road trip I have been on, where not a single song from my actual playlist got played. You all heard the #compliment version of the playlist, but it didn’t seem to matter too much. The company on the trip, and songs everyone sang more than made up for that. I also didn’t sit behind the wheel even once and that did not matter too strangely. When I look back on this trip, the only thing that I really remember are the precious moments we all had with each other. We really got to know one another, and put up with each one’s idiosyncrasies. We went as 20 individuals but came back as one group. That is the first reason for me to call this trip a success. The trip to Tso Moriri, the only thing crossing our minds was to see you guys in piece. The Chushul sector is not known to be too friendly. That was the only reason for us to make a run; and we were prepared enough to camp out in the night in case we did not make it to the Korzok village. That would have been an experience too! But it’s usually just Deepak and I who get caught in those situations. One thing about the trip we could do better next time around is probably have some more maggi. All I can say Vineet is that you guys just knew how to get us to have fun and create memories for life. Have always and will always look forward to going #AageSeRight with you guys. I know there will always be adventures along those lanes. Never been but thanks for adding to my intrigue! Beautiful pictures. Can’t wait to come back to it later when i’m headed that way! Thanks Anna and you most definitely should keep aside time for Ladakh when in India. Thank you Lloyd. Rightfully in your list. Loved reading yours and the teams exploits as the action continues in part-2. Indeed an amazing journey with experiences to cherish for a lifetime. 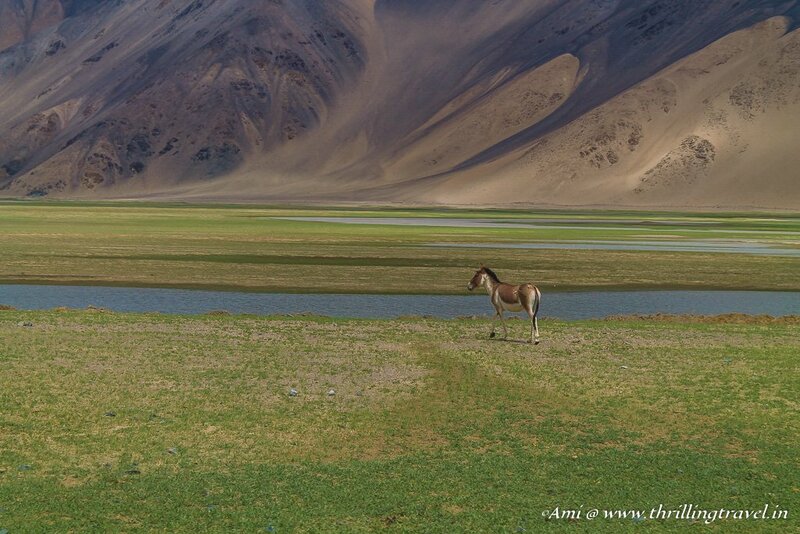 I loved the picture of the horse near the Indus river, he looks so free and without a care in the world against the wilderness. This is a very comprehensive itinerary of a road trip to Ladakh. Many people fly directly there. But in my opinion, the road trip has a charm of it’s own which nothing else can beat. By the way, couldn’t help staring for long at your beautiful snaps. Very well captured!! Thank you Neha. Glad you liked the account. I still have loads to share. Will do so in bits and pieces. 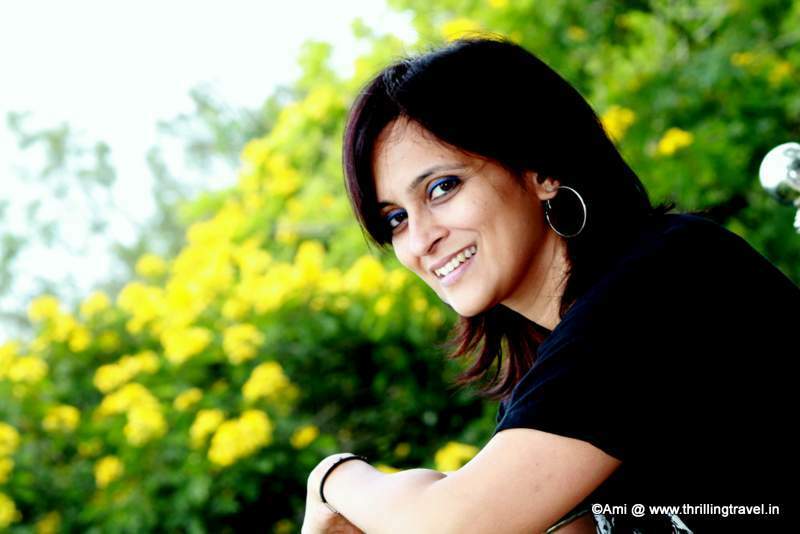 Yet another beautifully written blog from you Ami ! Ladakh’s uniqueness can’t really be covered in a single trip or even two. Every time you visit you will learn something new. Our role here was to try and get as much info about the places we visited to all of you. Hope we succeeded to an extent while making sure all of you were safe. But hats off to the entire bunch ! Most hardened travellers have had difficulty in travelling on such terrain for days on end. But this team just did not complain. It was a fun fest for all of us ! Let’s do this again. Good post, good photos. Keep it up, Ami. You have a flair for words. Finally, you have been Lehed. What an incredible road trip. I love off-the-beaten-track roadies and this one certainly tops any I have done. The photography is beautiful, too. Thanks Mike and since you like the off the beaten track ones, this is perfect for you. Must try it in India. Thank you for sharing this epic journey with us, Ami. The road to Ladakh looks like quite the adventure! It definitely was Doreen and I can so do it all over again! What fun trip and great anecdotes ! You really make memories that last you a long time when you take road trips. Lovely captures too ! Don’t we know that better Swati. Another of my favorite trips is our Great Rajasthan tour. Can never forget those trips. Ladakh was spectacular nonetheless. Ladakh has always been on my bucket list. These photographs are just breathtaking. It just bumped Ladakh up the list. I miss my trip to Himachal too. I can’t just forget the views just like the ones you have taken during a road trip to Ladakh. I remember how our last day was sombre just like how you felt. We just didn’t want the trip to end. Scout my trip was very well organised and they knew exactly what to do. What a very long and memorable road trip you had. Such an aamzing adventure and I enjoyed the photographs in this post. The scenes are all picturesque and wonderful. It’s a long journey wherein your eyes are filled with beautiful panorama, breathtaking landscape and have inner peace. What an amazing journey you had, I hope I’ll experience this kind of road trip too. Thank you Blaine. It sure was an epic trip and yes, I do wish one for you too. It does leave you with so many lifetime memories. Whoa! 11 days of solid fun and excitement! The scenic beauty all around is mesmerizing and the pictures are so full of enjoyment. I too could have been a part of this if I could spare this stretch of time. It was fantastic Indrani. You would have had a lovely time. But yes, I understand your constraints on this one. Hopefully we will have another rocking trip soon! Wow the trip to Ladakh looks quite an adventure. Wait….didI read it right? ” A CLOSE ENCOUNTER WITH CHINESE SNIPERS”? Thanks Kenneth. Looks like the Effect worked…..;-) They say that the mountains along the Chinese borders did have snipers looking down at us. Who knows though! Stunning pics. And can I just admit I am jealous! I did this road trip in 2003, too many years ago. Time to go back to Ladakh with hubby and kiddo. Your landscape pics are so dramatic! Hope you get over your travel hangover soon! Trust me, the real landscape is so mesmerizing. No wonder it holds me down. Sigh! The views look absolutely amazing during the whole trip! This must of been a quit adventure. And the photo of the sunrise is stunning! I would be so scared of getting the mountain sickness but I would probably still go, how could I say no to this. The ScoutMyTrip team took adequate care of ensuring we acclimatize well. Am sure you too would have been fine. The road trip was just amazing! 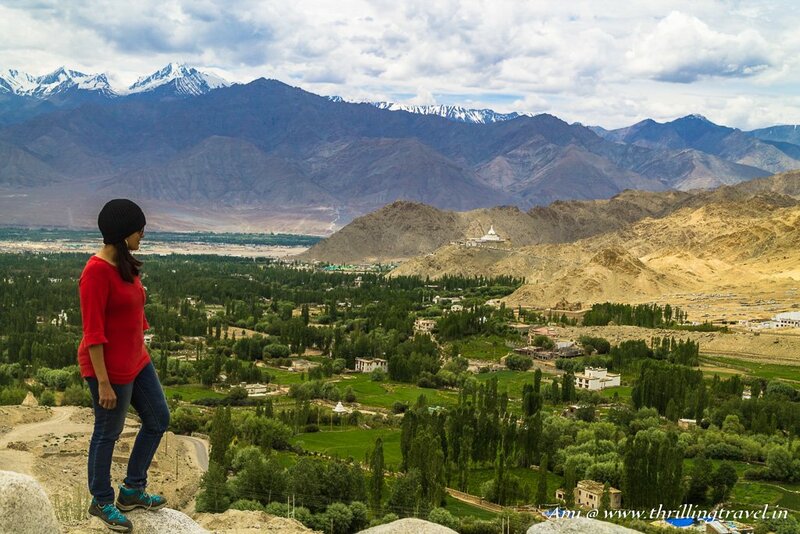 Reading this post brought back my own travel memories in beautiful Ladakh. The brush with chinese snipers sounded crazy, that path runs really close to China no doubt! 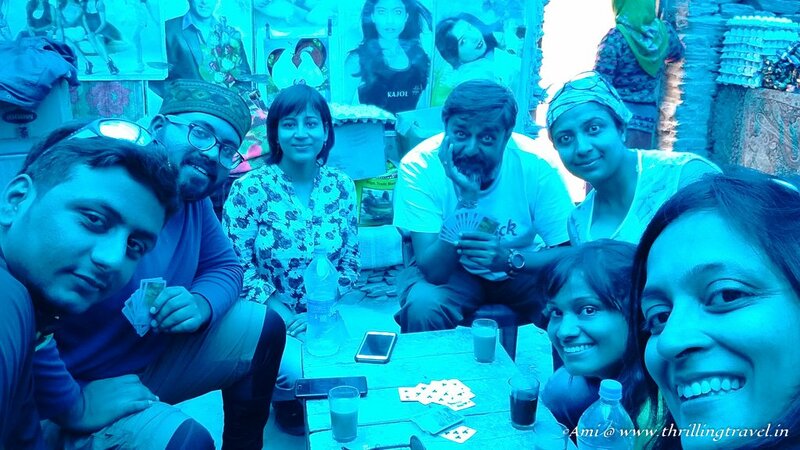 I loved reading about the group fun you guys had in Ladakh! Thanks Tania. It is amazing how close we were to the border. And in some ways, so ignorant of it. However, it was fun nonetheless. Your words were enough to tempt me but your photos convinced me Ladakh is somewhere I HAVE to experience. What a gorgeous landscape and a beautiful adventure! Trust me Aisha, the real thing is even more amazing. I hope you plan a trip here. Every bit of this trip was exciting. The monasteries for sure as well as the off roading and the adventures along the way. Am sure you too, will have fun with it. What amazing landscapes and such an adventure! Lucky lucky!! Thank you. It sure was a fascinating trip. I think I have missed the part 1 of your amazing trip but considering that I really liked this post, I have to read the previous one. This place looks beautiful especially because it’s surrounded by nature!! Thank you so much. Each day of this 12 day trip was epic. Glad you liked reading about it. Have been dreaming of Ladakh for such a long time–infact, for a decade. it genuinely is on my top 3 dream destinations list. need to figure out a way to Mae it happen! Oh my goodness – I can’t believe how incredible the scenery is! 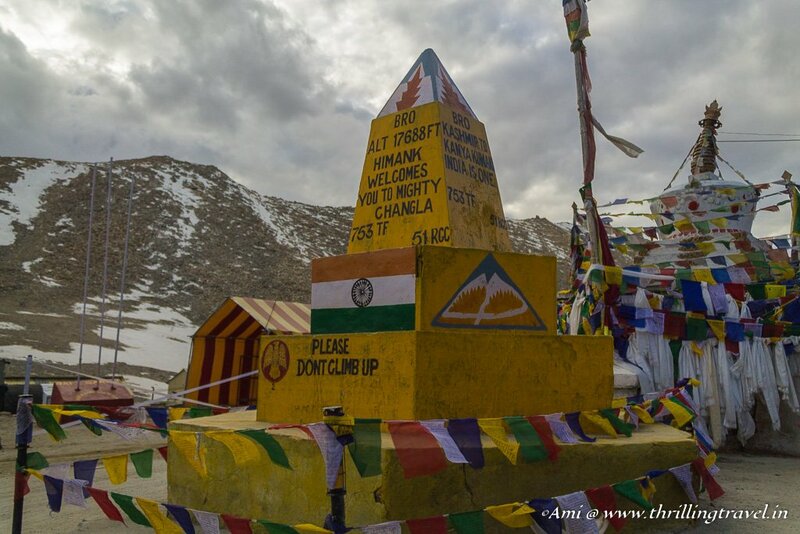 The Changla and Rohtang passes are stunning, and it looks like you and your fellow bloggers had an amazing trip. I hope to see it with my own eyes one day. I do hope you plan a trip here. It is just amazing to see nature like this. Thanks for stopping by Flo. The place does not look real Ami. Wow! How stunning. From your image placement, and the resolution. I do feel like I am there, in Ladakh. Well done and as always, thanks much for sharing. Thank you Ryan. It is so hard to believe but this place is real and amazing. Wow, what an adventure! The scenery is absolutely stunning. I would be depressed if I had to leave there too. Thanks Sara. I still am in a trance from this trip. 🙂 So you can imagine. Your Ladakh road trip posts are truly a weblog – an online journal or diary (the kinds I used to keep offline as a teenager). The account faithfully captures the happenings along the way. Enjoyed reliving the trip through this account! Thanks Ajay. It sure was a lovely trip and it was good finally to catch up with you. Thanks a ton Divsi. That really feels good to read. I cannot and will not be able to forget this trip for a long long time. And I know I will be returning to Ladakh once again, but this one will always remain special. Thanks Novarino. I think you will find plenty of other articles now on Ladakh here. Take a look. Incredible scenery to be blessed to witness. The monastery looks incredible. It really is amazing that they could construct something that incredible back then. As I keep reading the scenery gets better and better. SNIPERS! OMG! That trip really is a memory you will never forget. Thanks a ton guys. And you are so right about that – this is one trip that I am never ever going to forget! It sure was fun and memorable and you must do one in summer. Thanks for stopping by Swati and Sam. Ladakh is my favorite place for travel any time. i like your tips and travel information day wise. i like your colorful photos which is calling me for visit ladakh again. Thank you. It is my favorite place too and I really want to go back. Hey, This is really amazing post I have seen. Nice writing with beautiful pics. It is a Surreal place and one unexplored one. You most definitely should go. This is such an amazing road trip! I think the best road trips have adventures and unexpected twists like yours. 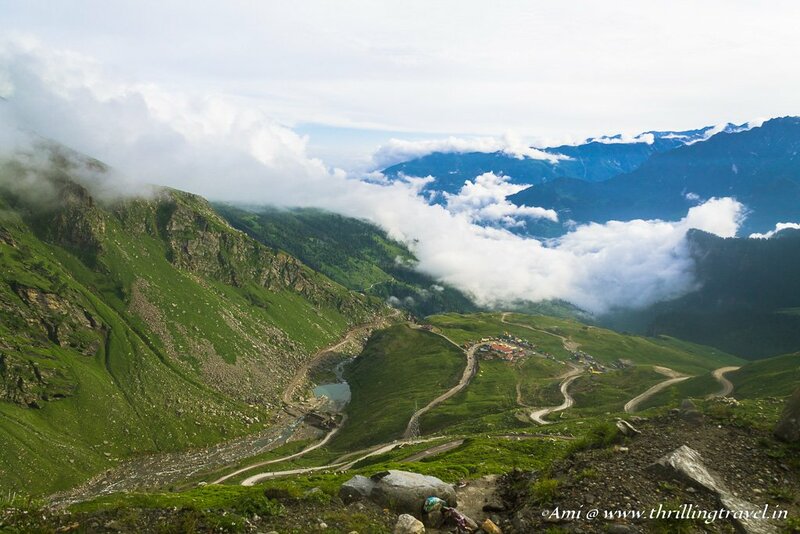 That view from Rohtang Pass is absolutely incredible. I can see why everyone was depressed at the end. I love your writing, your sense of humor comes through. The Thiksey Monastery looks amazing. 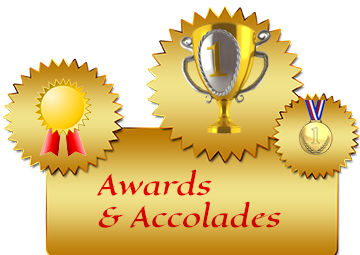 It is cool you got into the India book of records and had so much fun doing it. The things that went bad, turned into great memories because of your attitude. Good work! Thanks Chris for the lovely comment. The so called bad things led to the best memories. I would not have it any other way. I’d never really heard of Ladakh, but I can see how utterly spellbinding it is! So beautiful and you’ve captured some excellent photos. I’m so sorry you had a flat on your trip, but those experiences tend to shape us I think! Thanks Samantha. The flat frankly was an amazing part of the adventure.. Allowed us time to take in the beautiful place. What a gorgeous view! OMG, I thought I was the only one who leans out the car window to get a photo! Great shot of the Thiksey Monastery, the architecture looks amazing. Looks like such a fantastic trip! I was looking forward to reading part 2 — Wow, your photos once again are spectacular. This is the reality of India it is a very big country and with mountains and rivers like this, it takes 4 hours to go 115kms! I hope to get to this part of India someday — I think I will need more rest stops like the one you did in Manali! Your entire road trip has been quite an adventure! The people you are traveling with sound like a fun bunch of travellers, too! I’ve really enoyed seeing your photos, and hearing your stories — you’ll have wonderful memories for a lifetime. You bet, those memories are here for a long long time. Thanks for stopping by Tami. A road trip to ladakh is quite adventure that everyone like the trip very much. This an amazing journey to cheer up the people with the beautiful snaps.